Running numbers: 3100 - 3104, 3150 - 3190, 4100 - 4179, 5100 - 5110, 5150 - 5199, 6100 - 6169, 8100 - 8109. 1939 (4130 - 4139) to lot number 323. This class of 290 locomotives of the large prairie tank engines were the general workhorses of the Great Western. The prototype, number 99, was produced in 1903 and given a full trial over the next two years. Fitted with the Standard number 2 boiler running at 200 p.s.i., flat topped tanks and driving wheels of 5 feet 8 inches diameter, another thirty-nine examples were built when the soundness of the design was proved. This batch of locomotives differed from the prototype in that the tank tops were sloping and flush cab sides were fitted instead of a marked relief between the tank and the bunker plates. The running numbers of this batch were 3111 to 3149 and the prototype was renumbered 3100. 1906 saw the first alteration to the design of the class, when numbers 3150 to 3190 (known as the 3150 class) were produced using the Standard number 4 boiler, again running at 200 p.s.i. When numbers 3100 and 3111 to 3149 were renumbered 5100 and 5111 to 5149 in 1927 ( see modifications ), the next additions to the class filled in the numbers 5101 to 5110 and extended the class to 5189. These engines used the Standard number 2 boiler but, as in other locomotives in the 51xx series, had an axle loading of 17 tons 12 hundredweight. Bunkers were also enlarged to increase their coal capacity. The next batch of engines, 6100 to 6159, had a small but significant alteration to the original design in the use of 225 p.s.i. boiler pressure. This small change increased the tractive effort from 24,300 pounds to 27,340 pounds. Additions to the 5100 and 6100 classes were made until available numbers were exhausted, and forty engines were built in the 4100 series. These locomotives were built to the same specification as the 5100 series. In 1938, it was planned that a number of the 3150 class and 5100 class engines were to be rebuilt to modern standards and working other duties such as banking assistance. One of the two classes of rebuilds were the 3100 class from the old 3150 class. These engines used the Standard class 4 boiler again, but working at 225 p.s.i. and using coupled wheels of 5 feet 3 inches diameter taking the tractive effort up to 31,170 pounds. Due to the onset of the war, only five engines were modified, namely 3173, 3156, 3181, 3155 and 3179 which were rebuilt as 3100 to 3104 respectively. The other modified class were from the 5100 series and rebuilt into the 8100 class and were fitted with the Standard number 2 boiler, but working at 225 p.s.i. and coupled wheels of 5 feet 6 inches diameter. Ten of these engines were produced from numbers 5100 (the ex-prototype number 99), 5123, 5118, 5145, 5124, 5126, 5120, 5116, 5133 and 5115 and rebuilt as 8100 to 8109 respectively. The last of the large prairie locomotives constructed were 4140 to 4179 which were basic additions to others in the 4100 series. As with most classes of GWR engine, superheating was applied from 1909 and top feed was fitted from 1911. As previously mentioned, numbers 3100 and 3111 to 3149 were renumbered in 1927 when their axle loading was reduced from 18 tons 4 hundredweight to 17 tons 12 hundredweight. 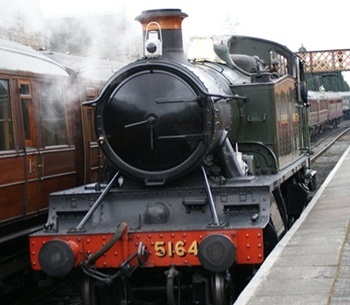 Outside steam pipes and the curved front frame was fitted as standard to number 5101 onwards, previous engines being modified when new cylinders were required. 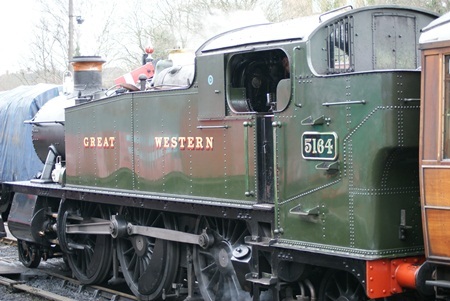 14 engines of the 5100 and 3150 classes were withdrawn in 1938/9 to be rebuilt as 3100 and 8100 classes prior to 4 engines of the same classes being withdrawn in 1947. The last of the large prairies withdrawn were 11 members of the 6100 series that worked up the last month of Great Western steam operations in December 1965. 10 engines of the 5100 and 4100 series have been preserved are they are numbers 5164, 5193, 5199, 4110, 4115, 4121, 4144, 4150 and 4160. In addition, 1 member of the 6100 class survives, number 6106. Specifications of the 5100 class with superheater.